The scene from this week’s gospel reading lingers in my mind and replays as if there’s still more I have to learn, more to do. It might have something to do with the fact that I just visited the site where this likely took place. Magdala, near the modern day Migdal, is on the coast of the Sea of Galilee. Currently they’re building a guest house (hotel), have built a beautiful church, and are excavating a first-century synagogue and marketplace. The sun burns hot and bright. From the pathways, one can tell that if there were many people, it would indeed be crowded and smell of warm bodies, fish, dirt, and hot stone. When Jesus arrives back on this side of the sea, Jairus seeks him quickly, desperate for Jesus to heal his 12-year-old daughter. We know he’s desperate because this is a leader of the synagogue, an important and powerful man (with a name), and what he’s doing is unorthodox (in more ways than one). Jairus tells Jesus what needs to be done, and without a word, Jesus follows him. On their way, among the great crowd, another person seeks a miracle. While the crowd walks along en masse, we get the background of an unnamed woman. She’s been bleeding for 12 years. Maybe for the first few weeks, months, she thought it would pass, but as the months became years, she spent everything she had to find a cure. No physician had been able to help her, but she had heard about Jesus. Even though she was closed off from society in her constant state of uncleanness, word had reached her about this man who healed many; maybe he could heal her, too. To seek Jesus would be a great risk for this woman. For 12 years, she stayed out of crowded situations, lest she contaminate someone with her impurity. Surely everyone knows about her, her family. It would be a shame upon her family to be seen or called out, recognized by someone–anyone. But what did she have to lose? She was cut off already from whatever life she had before. She had no money. Her condition was worsening. She wasn’t afraid to die; death was already a certainty. “If I but touch his clothes, I will be made well,” she thinks in her familiar voice, with an unfamiliar hope. She approaches Jesus from behind in the crowd and touches his cloak. One simple, light touch. Immediately her hemorrhage stopped, and she felt in her body that she was healed, something she hadn’t felt for 12 long years. In that same instant, Jesus, too, knew power had gone out from him, and he stopped. I like to imagine him closing his eyes and with a faint yet knowing smile that passes quickly, pausing before he turns to seek the one who touched his clothes. The one he calls out is afraid. Jesus was on his way to heal the daughter of a powerful man. She is a nobody, an unclean woman who has not only contaminated everyone she’s touched in this shoulder-to-shoulder crowd but has also brought shame to Jesus and her family by touching a man whom she has no right to touch. She knows her humility and shows it to all by falling down before him. She unburdens her heart and woes to him and everyone listening. Maybe they’ll understand, maybe they won’t. Maybe they’ll be merciful, but it doesn’t change the fact that she knows she’s been healed. But she couldn’t just take it from him without him knowing how desperate she was. She has no need of shame, and she has not taken anything that hasn’t been given to her. While we may want to marvel in this moment of grace and mercy, we’re reminded that Jairus’ daughter is also waiting for a miracle, yet we hear that she’s already died. “Do not fear, only believe,” Jesus says even in the face of mortality. Perhaps the crowd didn’t believe Jesus could help the little girl because she was already dead. Perhaps the crowd didn’t believe the hemorrhaging woman was healed because they couldn’t see it. They needed to see a healing for themselves, and it was all the more significant because this was the daughter of a prominent family, with so many people at hand (whom Jesus sent outside). Yet Jesus tells them not to spread news of these miracles. The significance of these events isn’t to spread Jesus’ fame any more than it is to add to the drama of the narrative itself, though they do both. As we encounter the good news of these stories, we find that rich or poor, young or old, alone or accompanied, Jesus is who he is for all: God incarnate to save the world. Today, does that mean that if we pray hard enough, we’ll be healed and cured or brought back to life? Not necessarily, and not as we understand it. It was important for the people of the time of Jesus to see him for who he was. For us, we realize who he is for us as the Risen Lord, one who brings health and life to all in spirit, which in turn affects our mind and body. In light of the gospel today, I wonder if we only seek Jesus when we are desperate? As beautiful as it is, it can also be devastating if we don’t get the results we want or expect. 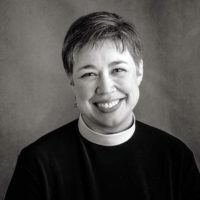 Pulling from the Presiding Bishop’s theme of love, life, and liberation, we want these things for ourselves especially when we don’t have them. But what if we seek first the kingdom of God? And its righteousness? (See Hymn 711.) What if even when things are good for us, we seek God’s will to be done in our thoughts, words, and deeds? What if we seek an encounter with Jesus? Even more, what if we seek to be that holy temple that others might encounter Jesus, the presence of God, through us? The most beautiful thing I saw at Magdala was the mural behind the altar in the Encounter Chapel at Duc in Altum (which means “launch into the deep”). Painted by Daniel Cariola, the mural captures that moment when the woman touches the hem of his garment (pulling more from the Matthew and Luke accounts). There’s a point of light there that illuminates what we know couldn’t be seen by the eyes alone, but it is so luminous in that chapel, amidst the feet and hand that are larger than life. As we gazed upon this mural, our feet rested upon floor that we’re told was from the first century, stones from pathways that would have been there at the time of Jesus, the disciples, Jairus, and this woman. In her outstretched hand, there’s such hope amidst her desperation. 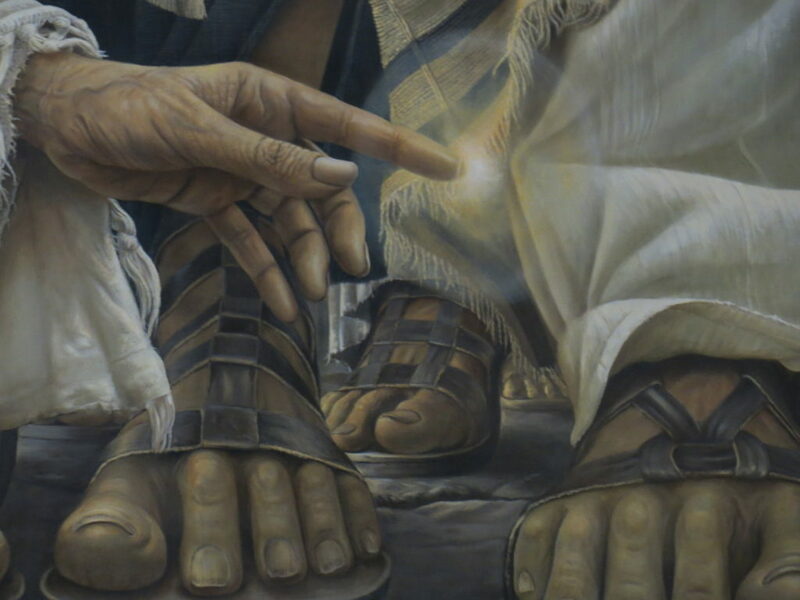 Jesus’ feet are set in a forward direction. Others are all around. It is a crowded scene. But there’s this point of light. When have I reached out to Jesus and been healed? When have others reached out to me in their search for the presence of God? That point of light, to me, is what we all seek, but we have to be clear about what and why we seek it. If we’re just looking for a thrill in the moment, personal glory, or a fulfillment of a personal agenda, we must tread carefully. This is especially important at General Convention, when what we decide affects the polity and liturgy of our church. Whose will is being done? Whose kingdom is being magnified? There’s nothing more noble than seeking an encounter with the Light and Love of Christ, because in that moment, we get a glimpse, a taste, of the kingdom of heaven. Whether we’re the hand or the feet in that moment, we pray that God’s will be done and to God be the glory. This work never ends.